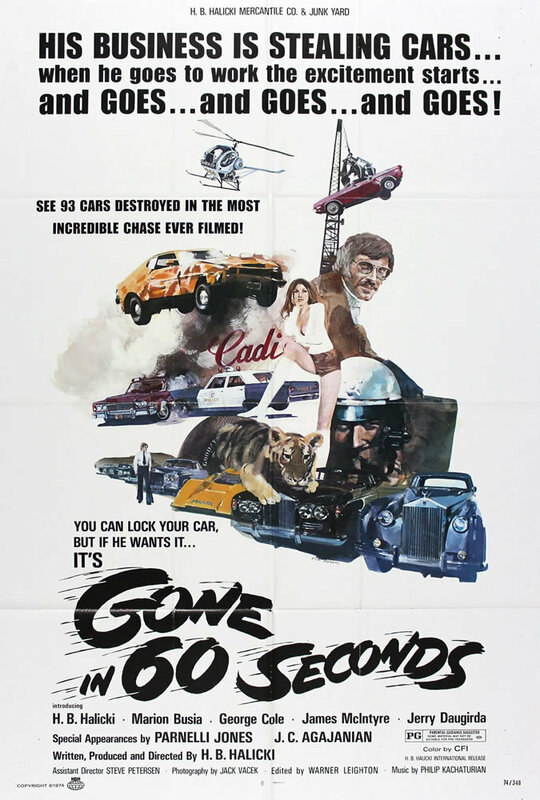 What does the title “Gone in 60 Seconds” mean? What is the reason for the movie title Gone in 60 Seconds? I could not find any explicit reference to the title during the movie. I expected a 60-second car theft or something like that. The title is referring to cars and the time it takes to steal one. The 2000 remake takes the same title and overall plot. which reinforces the overall idea. When Mirror Man is talking to the clerk at the police impound yard, a sign can be seen in the background that reads "If you leave your car unlocked it will be Gone in 60 Seconds (1974)". This same sign was used in the original 1974 version of the movie. I believe this is the true inspiration for the movie's title. It's evident that the 2000 movie takes its title from the 1974 one and the origin of the 1974 title is actually that catch phrase that was shared by the second answer. Bruckheimer's latest, Gone In 60 Seconds, takes its title, basic premise, and a few gags from a 1974 exploitation film of the same name by used-car dealer turned actor-director H.B. Halicki. Not the answer you're looking for? Browse other questions tagged title gone-in-60-seconds . What does Book of Shadows stands for in title of movie Blair Witch 2? What is a “shadow game” from Gone in 60 Seconds? Significance of the movie title Magnolia? Why is Death Proof presented specifically as Thunderbolt for a brief moment? Does the title of True Detective have any meaning within the show? Why does “The Last House on the Left” have that title? What is the significance of the title “Rangasthalam”?